Wow. In my life I've been to dozens of Blue Jays games, dozens of Maple Leafs games and dozens of Raptors games. I've been to Marlies games, Argo games and WWF cards. 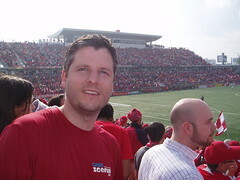 I've been to all of these live events in this city, but I've never experienced what I experienced this afternoon at BMO Field. For over 90 minutes of play, everyone was on their feet singing, chanting, dancing, stomping and cheering. It was as if everybody was reading from the same handbook. When the players are introduced, the public address announcer just says the Toronto FC player's first name and we all yell their last name. At the 23-minute mark, we all sang a song for Danny Dichio, because he scored the franchise's first ever goal at the 23-minute mark. There were lots of customs and practices to obey. The songs were awesome. There were songs for certain players, such as the spin on "Hey Jude" for Maurice Edu or the call and response between sections for Marco Velez. 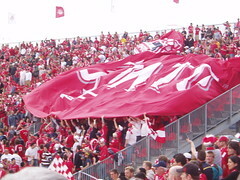 There were anti-Galaxy songs, such as the super catchy "F*ck Galaxy" and love songs for Toronto. There was a song to start things off, a chant to remind the opposition "this is our home", anti-Beckham songs and even "Seven Nation Army". My favourite songs were the anti-ref songs which we sang whenever a call went against us. There was even this French question we'd ask the section across the field and then they'd answer and we'd both do this dance. 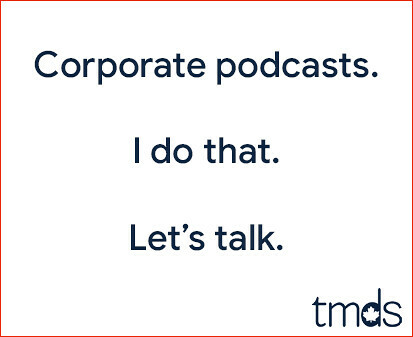 That one is tough to explain... but super fun. In addition to the singing, chanting and dancing, there was also a soccer game. I was worried it would be a boring 0-0 game, but I actually got to see two Toronto FC goals and at least six other solid scoring chances. I was stunned by how dominant we were and how much offence there was. It could easily have been 5-0 for the good guys. Thanks for the ticket, Elvis. I'm seriously starting to think I was wrong about this franchise. I didn't think a professional soccer team would make it in this city, but today I witnessed 20 thousand young, enthusiastic fans treat the event with all the ritualistic fervent of a religious gathering. This was their church, and there was no sign of impending apathy. Here are dozens of photos I took this afternoon during my very first Toronto FC game as we beat the Los Angeles Galaxy 2-0. I forgot to mention... I bought Elvis a beer, and it cost $13. Yikes!!! $13 for a beer?!?!? Rookie defender Julius James made his long-awaited Major League Soccer debut on Saturday, and boy was it ever worth the wait. 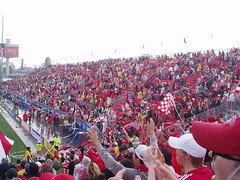 James came on as a substitute early in the first half and scored his first professional goal to pace Toronto FC to a convincing 2-0 victory over the David Beckham-less L.A. Galaxy on a rainy afternoon before 20,096 fans at BMO Field. Jeff Cunningham also scored for Toronto, which improved its record to 5-3-2 on the season and sits in fourth place in the Eastern Conference with 17 points. “It was unreal. I’ve been waiting for a while and I got the chance today, and with the help of my teammates, things worked out,” James told reporters after the game, a toothy grin etched on his face. “I’m delighted for Julius because it’s his first game and goal, which is great. He’s come in, stepped up and was fantastic,” said Toronto coach John Carver. Beckham, the Galaxy’s star midfielder, didn’t make the trip to Toronto because he was called up to play for the English national team in an exhibition match against Trinidad and Tobago in Port of Spain on Sunday. Beckham wasn’t the only player who missed Saturday's contest due to national team commitments. Toronto was minus goalkeeper Greg Sutton (Canada), midfielder Carl Robinson (Wales) and forward Amado Guevara (Honduras). Three other regular starters — French winger Laurent Robert (suspended), forward Danny Dichio (groin strain) and defender Tyrone Marshall (hamstring injury) – were also missing for Toronto. Carver was impressed with the way his team played without so many key players. “This game shows we have a bit of bench strength and depth. That’s why this performance has given me more pleasure than any other game this season,” Carver said. James was Toronto’s top pick (ninth overall) in January’s MLS draft, but a shoulder injury suffered in the pre-season and new player signings later in the campaign prevented him from making his debut until Saturday. The Trinidad native admitted he was frustrated over his lack of playing time, but said his older teammates encouraged him to be patient. Despite scoring and putting in a poised performance, James believes he still has some work to do in order to crack Toronto’s starting lineup. James came on for the injured Olivier Tebily (strained calf muscle) in the 18th minute, and the young defender wasted little time in asserting himself, trying to beat Galaxy goalkeeper Steve Cronin with a lob from the centre line. The first half was a contrast in styles, with the Canadian club efficiently moving the ball around in midfield and looking to spring the speedy Cunningham free, and L.A. playing conservatively and launching counterattacks. Toronto started brightly and nearly opened the scoring after just 15 seconds, but Cunningham couldn’t connect on a dangerous, low cross played deep into the penalty box from the right wing. The Galaxy’s only scoring opportunity came late in the first half when former Toronto forward Edson Buddle ballooned his shot over the crossbar following a slick passing sequence by L.A.
A torrential downpour at halftime led to slippery field conditions in the second half but it hardly slowed down James. The rookie defender out-jumped two Galaxy players inside the box on a free kick from teammate Rohan Ricketts and connected on a beautiful header that sailed past a diving Cronin at the 49-minute mark. The Galaxy’s defence was rattled and conceded a second goal in the 65th minute. New Zealand forward Jarrod Smith fed a perfect, defence-splitting pass to Cunningham who burst into the penalty area and beat Cronin with a low shot. Toronto poured on the pressure and overwhelmed the beleaguered Galaxy defence. Cunningham nearly added a second goal, only to see his shot whisper past the post, while Smith squandered a glorious breakaway opportunity. Rookie goalkeeper Brian Edwards earned his first career shutout in only his second regular-season appearance for Toronto. 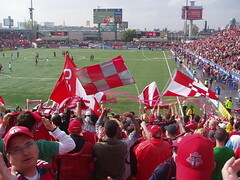 Toronto’s next game is on the road, against two-time defending MLS champion Houston Dynamo on June 8. Interesting Mike, I think we have a team in Rochester? Id root for Toronto, how much are tickets? I'm told you simply can't buy a ticket - and there's crazy demand for them. So, if you want in, you have to know somebody or buy the tickets from a scalper. Can we even say "scalper" anymore? Those dudes need a new label. We'll call them unlicensed ticket brokers. Okay if you wanted to buy a ticket and there were some available, how much do they go for? I just checked out a ticket broker site and saw a range of $88 - $3500. Wow, look at the guys in that crowd! I've gotta get to an FC game! It's 95% guys... and the vast majority are aged 24-39. And, judging by the price of beer and the intoxication levels, they're all rich! Can't wait for Vancouver to get in the league! I can't believe that you got into the south end! TFC games are a ridiculous amount of fun and the fan devoition is crazy.